I've just returned from a break in Koh Samui, and it was good to see the old girl. She's changed a lot in three years; a central shopping mall, some huge hotel developments, boutique shops, noticeably more families and retired couples, lots more traffic and a lot of Russian investment, but she's still got plenty of charm to offer. There's still some beautiful beach spots to escape the tourist vibe, particularly on the Lamai side of the island, and loads of great new restaurants too – try Nadimos Lebanese restaurant in Bangrak for reference. I must say, Samui is still a favourite short getaway for me, not least because the flight is just 50 minutes from Bangkok; I was literally on the beach two and a half hours after leaving my apartment in BKK. 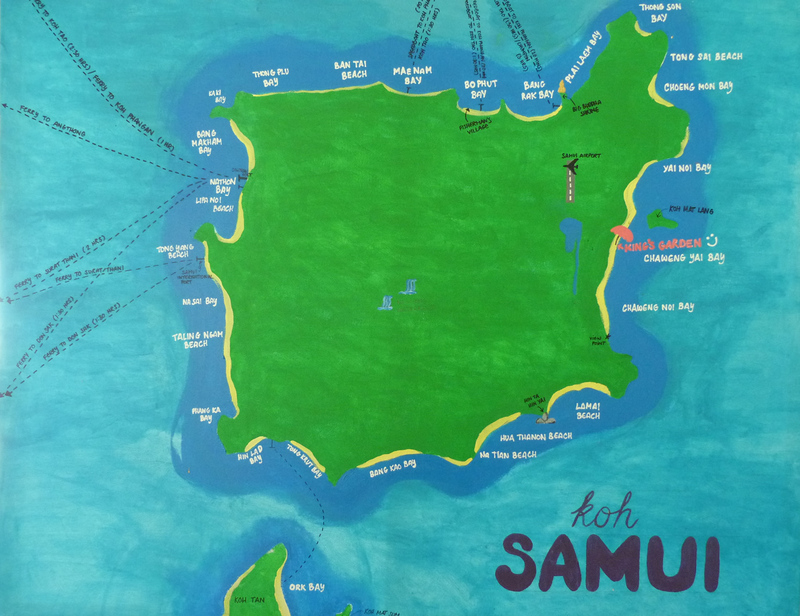 Anyway, while I was there I pictured a really cool map of the island that I thought was worth sharing with you, courtesy of the King's Garden Resort. It makes it really easy to reference different parts of the island without the distraction of every single tailor shop and bar plastered across the page. I can highly recommend the King's Garden Resort too. I don't usually stay in Chaweng, but because I was there to meet a few people also staying there too it made for convenience. I was travelling with a friend who'd stayed there before and assured me it was lovely. It didn't disappoint. It's right on the beach in a quiet spot, with a lovely view of the island. There's plenty of shade if you need it, too. The gardens are beautifully kept, it's kid/family friendly, the staff are efficient, breakfast is great and it's not in the busy part of Chaweng. It's also well set back from the road so you don't hear any noise at night. At 2,200 Baht ($60) a night, it's well worth it – a great place to chill. Check it out here. Yes it is possible; there are teaching opportunities there. And it is safe. Just take the normal, necessary precautions you would as a woman living in any foreign country, such as not walking around alone late at night.